Goldmine Creek Ranch - Clayton Leverett - Stillwaters Land Co. DEED RESTRICTIONS HAVE BEEN MODIFIED, PLEASE INQUIRE. Location: Goldmine Creek Ranch is located 15 miles South of Llano, Texas and just shy of 32 miles North of Fredericksburg, Texas. 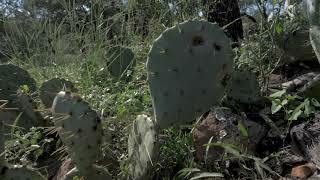 The ranch is situated 3.5 miles West of Highway 16 off paved Llano County Road 113. Land: GCR is gently rolling in topography. The ranch lays out in a roughly rectangular shape. There is a good mix of brush (predominantly tasajillo, whitebrush, mesquite, and persimmon), hardwoods (Live and Post Oak mostly), and cleared areas. The soil is sandy to sandy loam allowing the opportunity to plant a wide variety of species from grasses to food plots. There is buried gas pipeline easement and Central Texas Electric Co-op has an easement for residential electric distribution. The ranch does have deed restrictions and can be obtained upon request. Water: Goldmine Creek (a wet weather creek) flows through the Northeast portion of the ranch and with the amount of watershed, its believed to have excellent potential for a pond/lake. A portion of Goldmine Creek lies within the 100-year floodplain. A pond in the SE corner of the ranch is approximately acre when full. Improvements: A water well, logged at 7 gallons per minute, was drilled towards the Northern end of the ranch but is not outfitted with a pump at this time. A windmill near the larger pond is currently not in operation. Electricity is nearby. There are no other improvements. There are modest deed restrictions in place. Please inquire for more information. Buyer(s) broker must be identified on first contact and must accompany buying prospect on first showing to be allowed full fee participation. Fee participation will ultimately be at the sole discretion of the listing broker. From Llano, Texas drive South on Highway 16 approximately 15 miles. Turn West on County Road 113 and drive 3.5 miles. Property is on South side of the road.